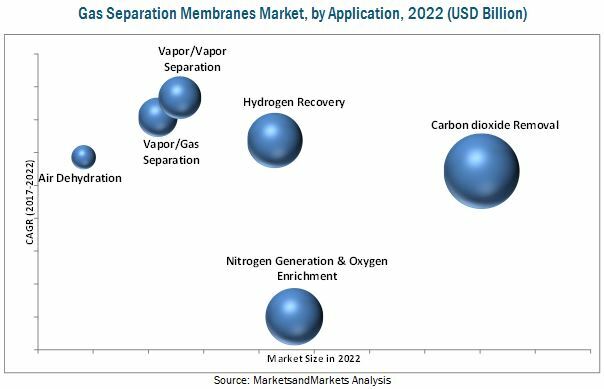 [122 Pages Report] Gas Separation Membranes Market is projected to reach USD 2.61 Billion by 2022 at a CAGR of 7.2% forecast period. The base year considered for the study is 2016 while the forecast period is from 2017 to 2022. Gas separation membranes are used to separate and purify a specific component from the rest of the mixture. This technology is widely used for industrial purposes. Cost-effectiveness and energy-efficiency of gas separation membranes make them an indispensable element in various industrial applications. Gas separation membranes are widely used in nitrogen generation & oxygen enrichment, hydrogen recovery, carbon dioxide removal, vapor/gas separation, vapor/vapor separation, air dehydration, and others. Both the top-down and bottom-up approaches have been used to estimate and validate the size of the global gas separation membranes market and to estimate the size of various other dependent submarkets. The research study involved the use of extensive secondary sources, directories, and databases, such as Hoovers, Bloomberg, Chemical Weekly, Factiva, Commonwealth Scientific and Industrial Research Organization (CSIRO), Securities and Exchange Commission (SEC), American National Standards Institute (ANSI), Organization for Economic Co-operation and Development (OECD), and other government and private websites, to identify and collect information useful for the technical, market-oriented, and commercial study of the gas separation membranes market. The major market players covered in the report include Ube Industries Ltd. (Japan), Air Liquide Advanced Separation LLC (US), Air Products and Chemicals, Inc. (US), Generon IGS, Inc. (US), and Honeywell UOP LLC (US). “This study answers several questions for the stakeholders, primarily which market segments they should focus upon during the next two to five years to prioritize their efforts and investments”. This research report categorizes the gas separation membranes market on the basis of material, application, and region. A country-level analysis of the gas separation membranes market is provided by technology and application. Gas separation membranes are used to separate and purify a specific component from the rest of the gas or vapor mixture. Gas separation membrane technology is widely used for gas processing application in industries such as chemical, petrochemical, and manufacturing. Increasing demand from these industries drives the market for gas separation membranes. The market has been witnessing significant growth in recent years, and this growth is projected to persist in the coming years as well. The global gas separation membranes market is projected to reach USD 2.61 Billion by 2022, at a CAGR of 7.2% between 2017 and 2022. Gas separation membranes are used for nitrogen generation & oxygen enrichment, hydrogen recovery, carbon dioxide removal, vapor/gas separation, vapor/vapor separation, and air dehydration, which are the main application segments considered for the report. In 2016, the carbon dioxide removal segment accounted for the largest market share, followed by nitrogen generation & oxygen enrichment, hydrogen recovery, and vapor/vapor separation segments. The carbon dioxide removal segment’s large share is attributed to the growing need to remove carbon dioxide in natural gas pipelines for safe transmission. The vapor/vapor separation segment is projected to grow at the highest rate during the forecast period due to the increasing adaptability of gas separation membranes in refining processes. On the basis of material, the gas separation membranes market has been segmented into polyimide & polyaramide, polysulfone, cellulose acetate, and others. Among these, the polyimide & polyaramide segment accounted for the largest market share due to the excellent properties of polyimide & polyaramide, such as selectivity and thermal stability. North America, Europe, Asia Pacific, Middle East & Africa, and South America are the main regions considered for the gas separation membranes market report. Asia Pacific is the largest market for gas separation membranes. This region dominates the gas separation membranes market due to increasing industrialization, which directly drives gas processing activities. The market in this region is also projected to witness the fastest growth rate between 2017 and 2022 owing to the increasing demand for energy-efficient and cost-effective gas separation. Though the gas separation membranes market is growing at a significant rate, a few factors, such as the high price of equipment, shift of the end-use market from developed countries to emerging countries, and the rising cost of production, hinder the growth of the market, globally. Ube Industries Ltd. (Japan), Air Liquide Advanced Separation LLC (US), Air Products and Chemicals, Inc. (US), Generon IGS, Inc. (US), and Honeywell UOP LLC (US) are the leading companies in this market. They are also expected to account for the major market share in the near future. 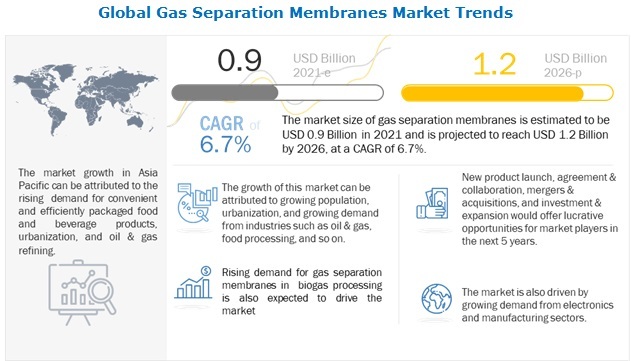 Entering into related industries and targeting new markets will enable the gas separation membrane manufacturers to overcome the effects of volatile economies, leading to diversified business portfolios and increased revenues. Other major gas separation membrane providers include Evonik Industries AG (Germany), Membrane Technology and Research, Inc. (US), Schlumberger Ltd. (US), and DIC Corporation (Japan). 10.3 Air Products and Chemicals Inc.
10.6 Fujifilm Manufacturing Europe B.V.
10.10 Membrane Technology and Research Inc.
11.4 Can Gas Systems Company Ltd.
11.10 Zhejiang Yuanda Air Separation Equipment Co. Ltd.